The mission of The Jenna Kast Believe in Miracles Foundation is to enrich the lives of Michigan children suffering from life-threatening medical conditions by buying gifts and bringing joy and hope to their lives. Along with their gift, each child receives a personalized trophy to acknowledge their courageous fight. The Jenna Kast Believe in Miracles Foundation is an all volunteer, grass roots organization founded in 2005 by two 11 year old boys whose goal was to bring a smile to the face of a child that is suffering. Our Foundation was created to let children and their families know that they are not alone in their battles, that we are praying for them and fighting for them. For more information about The Jenna Kast Believe in Miracles Foundation please see our Fact Sheet. More information about our Board Members can be found here: Board Member Information. 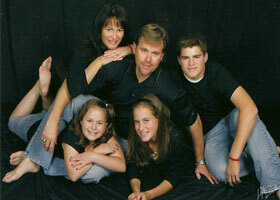 The Jenna Kast Believe in Miracles Foundation was founded in 2005 by then 5th graders, Brett Kast and J.D. Sterba. 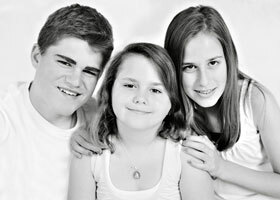 The inspiration came from Brett’s youngest sister Jenna who was battling brain cancer. While Brett and his sister Nancy would accompany Jenna on her trips to Children’s Hospital, Brett became increasingly aware of the suffering and hardships many children face. In January of 2005, the boys began selling the bracelets in their school, at their church and throughout their community. The bracelets were a big hit. After a local television station aired their story, interest in their cause continued to grow. The family formed a foundation in an effort to provide children an escape from their illness and to create positive, lasting memories for other families facing the same struggles. Since the foundation’s beginning it has been a source of strength and comfort for the Kast family and has enabled them to gain some positive meaning from Jenna’s battle with cancer. Nancy and Jenna especially enjoyed being a part of every wish. When Nancy was in middle school she decided to sell bracelets during lunch. “I want to keep granting wishes,” Nancy said. In May of 2010 Jenna hosted an ice cream sale and sold over 1,000 ice cream bars! Sadly, on July 4th, 2010 Jenna lost her battle with brain cancer. She will be forever missed by all who loved her. Brett wrote this special song for his sister.